For many consumers, purchasing a hot tub is a "once in a lifetime" event. The hot tub market in Northern America currently has over 100 manufacturers offering more than 1,500 spa models, many of which look virtually identical. The UK market is rapidly moving the same way with a multitude of different makes and features available. Below you will find the answers to some questions that will help you evaluate hot tub features and determine which product provides the best value for you and your family. If you have more questions please feel free to Contact us. What is the difference between a spa, hot tub, Jacuzzi and whirlpool? What is the difference between a therapy seat, a hot seat and a cool down seat? How long does a hot tub take to heat? How often do I drain the water to clean the hot tub? Can a hot tub be installed inside? Why are chemicals necessary to treat the water? How do I treat the water? Why shouldn't softened water be used in the spa? Are hot tubs only for use in the spring and summer? The word spa is commonly used to describe any one of a number of jetted, heated, water-filled tubs. Frequently, the words "spa" and hot tub" are used interchangeably, but a "spa" may equally be used to describe a jetted bath. Hot tubs provide massage via a number of jets, the type and placement of the jets being crucial to the quality of the massage. Good hot tubs also provide comfortable contoured seating. Hot tubs are not drained after each use, instead the hot water is preserved and chemicals are used to maintain water purity. They are filled via a hose pipe and do not need to be plumbed in. A whirlpool refers to a relatively gentle circular water action provided on many quality hot tubs separately to the massage jets. Jacuzzi is not a generic name for hot tubs, although it is often used as such. In fact Jacuzzi is a company that makes, amongst other things, whirlpool baths and hot tubs. Hydrotherapy is the combined effect of heat, massage and buoyancy. Warm water dilates blood vessels, increasing blood flow to sore or damaged tissues, allowing oxygen and nutrients to help overworked muscles recover faster. Massage, provided by the spa's jet system, relaxes tense muscles and relieves pressure on surrounding nerves. Massage also improves circulation and accelerates the body's natural healing process. Buoyancy reduces your body's weight by 90%. This relieves pressure on strained joints and muscles. Hydrotherapy is widely recognized as an effective method of alleviating the tension commonly associated with stress. 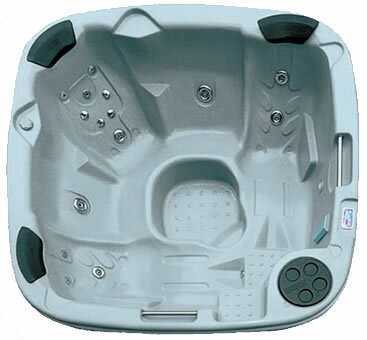 As you look at hot tubs you'll find a wide variety of different jets. The common thread is that they are located throughout a spa and they all mix air with pressurized water to produce a massaging effect. Many jets are interchangeable and often adjustable so the spa bather can customize his/her massage. Air injectors are not massage jets, although they are often described as such. They are generally located in the seat areas and, when activated, create a turbulent bubbling or boiling action which is pleasant, but does not provide a massage. If the tub you are looking at seems to have a lot of jets for the money check that they are indeed massage jets and not just air injectors. Real, beneficial hydrotherapy is directly related to being able to adjust each jet where it is needed. This is the standard by which physical therapy and athletic hydrotherapy systems are judged. A common point of consumer confusion is introduced when manufacturers load up a hot tub with lots of inexpensive, non-adjustable, stationary jets. It doesn't make any difference how many jets a spa has if they are not properly located and plumbed to provide the correct balance of water, air and power. Therapy seats are equipped with jets and are designed to provide a body massage. Therapy seats vary greatly in the number and type of jets. The best seats will provide simultaneous massage to the neck, back, shoulders, arms, thighs, knees, calves and feet. Hot seats are simply seats in the spa that do not have any dedicated jets. Cool down seats are at a higher level and enable the user to get part of his or her body out of the water to cool down. They also often conveniently serve as a step to get in and out of the tub. With a 3 kw heater in a fairly large hot tub it will take about 12 hours to get the water from the garden hose to about 38C, but the time will depend on the insulation and size of your hot tub and also on the ambient temperature. Most quality hot tubs have relatively sophisticated digital thermostatic controls. These highly reliable modern systems are capable of keeping the water within 1 degree of any temperature you select. While this is important for comfort, it is also important for safety. You should pay particular attention to the control system if you have children who will be using the tub. Better systems have safety locks and digital readouts. Virtually all hot tubs sold in the UK are heated by electricity. They can be equipped with various heaters ranging in kilowatt power (usually from 1kw to as much as 12kw). Obviously, the higher the power of your heater, the faster your spa will heat up from a cold. Any size heater will be able to maintain the normal desired heat range, but not all hot tubs are able to operate the heater and the pump(s) at the same time and so when using one of these tubs in a cool ambient temperature the water temperature will drop during use. The cost is dependent on a lot of factors, such as the cost of electricity, the ambient temperature and exposure to wind, how often you use your hot tub, the rating of your pump(s) and heater and how much you pay for your chemicals. However, if you budget for between 50p and £1 a day you won't be far out. We recommend draining and cleaning your hot tub no more than 3 or 4 times per year, depending on how frequently you use it and how well you maintain your water Most good hot tubs have a bottom drain that you can attach a garden hose to to remove the water, but you will find that using a submersible pump is significantly quicker. A hot tub can be installed indoors or outdoors, although over 90%, including those in cold weather climates, are installed outdoors. The two main considerations for installing a hot tub indoors are: Will it fit through the door? and: Is the structural strength of the flooring adequate? You should also consider whether you are likely to need a dehumidifier in the room. No. All above-ground portable hot tubs are filled with water using a garden hose. Many factors can affect the health of your spa and the people in it. The warmth and moisture offer an ideal breeding ground for bacteria, algae and fungi. They can spread disease and infection to humans. Improper water treatment can also lead to skin/eye irritation, equipment corrosion, staining and scaling of the surface and equipment. While some sales people may try to convince you that they can sell you a "chemical-free" spa, this is just not possible. Professional retailers and manufacturers most often recommend the use of ozone purification in conjunction with chemical products developed specifically for spas. Never forget that manufacturers may not warrant their product if proper water balance has not been maintained. Maintenance procedures are not difficult and knowledgeable retailers will provide the start-up kit and instructions you need. All Splash Spas hot tubs are supplied with an easy-to-use, three month ecoONE water treatment kit which comes with simple instructions. keep your water free from harmful bacteria. keep your water clear and comfortable to use. protect your investment in your hot tub. Why shouldn't softened water be used in a hot tub? Softened water can be acidic and deficient in mineral salts which will result in corrosion to the hot tub equipment. The result will not only be damaged equipment, but also discoloured water and brown or green deposits on the hot tub surface. On the other hand, very hard water is alkaline and high in mineral salts which may result in scale deposits or cloudy water in the spa. However although unsightly, scale will not cause lasting damage to the spa or equipment and can easily be treated by use of inexpensive products. Therefore, the use of hard water is always preferable to artificially softened water. No, most definitely not! The use of hot tubs is most popular in North America and Scandinavia when the outside air temperature is often sub-zero. In fact, research has shown that the therapeutic effects of a hot tub are greatest when the outside temperature is significantly lower than the water temperature. This means that the best time of year to use a spa is actually in the autumn or winter!